Madame Tussauds, the museum with a horrific secret. Also, murderer of the London Planetarium. Monsters. Madame Tussauds is a museum chiefly based in London, Britain, with branches in other cities in Europe, North America, and Asia. Founded by the Frenchwoman Marie Tussaud, it is a veritable tourist attraction for visitors of London, who to this day come to gawk at major historical figures, criminals, athletes, and self-absorbed idiots, encased in wax and still alive. 2 Marie Tussaud, wax "modeller"
Many medical methods are known to sustain life indefinitely in human beings. Cryogenics and breathing machines are a few of them; however, in those cases, restoration to life depends heavily on technology and maintenance; putting a frozen human in the microwave and setting it for two minutes defrost will likely leave a lot of ice crystals in some critical organs, causing some pain, but fortunately, in most cases, not for very long. Obviously, however, methods that rely only on magic are not subject to these sorts of problems, since everything works out rather magically. This is why wizards and witches searched for millennia for a magical life support mechanism. Near the end of the 1780s, they finally discovered it, and seeing that this article is about a museum of wax figures, the method should be patently obvious. However, with the rise of Enlightenment-era thought, wizards became increasingly unpopular since nothing they did made the tiniest twinkle of logical sense. Many of them were therefore burnt or beheaded. Of particular interest are the large-scale executions during the French Revolution of prophets and seers, largely because of predictions en masse that some short stocky bloke would take over France, stomp over the Revolution's aftermath like a madman, and restore monarchy and empire. 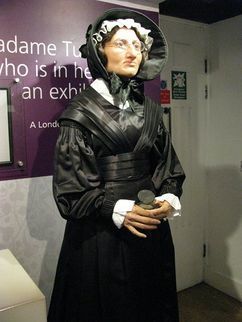 Marie Tussaud, keeper of immortality. Voltaire: Almost everything is imitation. Franklin: In this world nothing can be said to be certain, except death and taxes. Subsequently, he was replaced with an impostor, explaining why he was able to endure France for nine whole years rather than leave as soon as possible as any American would rather do. Soon, Tussaud met the French Revolution, and argued for having "wax" heads propped up on poles rather than real heads, since real heads tended to ooze blood and be generally disgusting. In this way, she was able to justify stealing corpses to encase in wax and hopefully reanimate someday in the future. In 1802, realising that the French justice system was no longer to yield disembodied heads, Tussaud went in search for somewhere more ruthless. Mistakenly believing that Henry VIII was still in power, she moved with her family and wax collection to London. After finding out that centuries had passed since the Tower's last prisoners had been beheaded and that affairs were more civil than militant, Tussaud attempted to return but could not due to the Napoleonic Wars over British Tory newspapers' erroneous reports of Napoléon's height. Oscar Wilde: Life imitates art far more than art imitates Life. Percy Bysshe Shelley: How wonderful is Death, / Death and his brother Sleep! In this way, Tussaud made the news come alive, albeit in a suspended state. 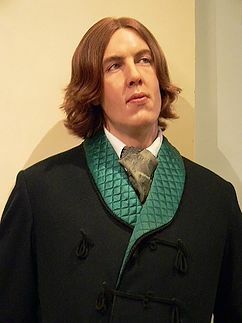 By 1835, hundreds of contemporary celebrities were literally immortalised, and Tussaud had gained enough money to settle down in London again and set up a museum there, which quickly gained in popularity out of sheer perverse curiosity. By 1842, finally weary of continued life, Tussaud encased herself in wax, leaving only a handful of staff knowledgeable of the secrets of the waxworks. Tussaud is still carefully preserved in the museum entrance, should the world once again require her magical powers and one-liners. 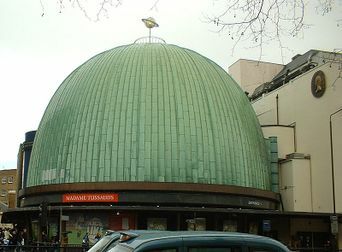 Following Tussaud's "death", the museum changed location (and added other branches as well) as well as ownership. Currently Madame Tussauds is owned by Merlin Entertainment, which surprisingly, despite its name, is not always involved with magical real estate, judging by the state of their other properties Alton Towers and Legoland. Recently the museum appears to have taken up a form of vigilante justice, taking awful human beings running rampant in the media and trapping them in wax to experience perpetual agony. Robert Pattinson: This is the skin of a killer! The museum also appears to have been involved in an alien invasion in 1970. If it feels kind of oily, it's wax. If it tries to kill you, it's plastic and you're dead. 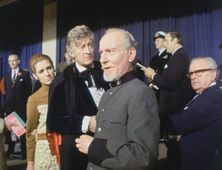 Hidden among these wax figures are a few plastic aliens, remnants of, yes, a 1970 alien invasion of London, when some of the waxwork staff were coerced into making plastic models of world leaders that the aliens could then use to take over the world. It's an awfully long story, and involves mannequins and tentacles and some bloke with two hearts. All you need to know is that, for the most part, the threat is past—the controlling intelligence was destroyed and sent to a recycling facility. The next time you're at Tussauds, though, do be careful turning up the thermostat. Either they're alive, or they're aliens, which means either they'll heat up, come back to life, panic and try to kill you, or they'll feel a bit too uncomfortable, blame you and try to kill you. On second thought, you never know how the weather's going to turn out, so just stay as far away as you can from the thermostat. Just bring a coat or something. Much more sensible. For those without comedic tastes, the so-called experts at Wikipedia have an article about Madame Tussauds. ↑ The name originally had an apostrophe, reading "Madame Tussaud's". However, nobody used the apostrophe anyway because it made them look pedantic. ↑ Some have claimed that any sufficiently advanced technology is indistinguishable from magic, which of course would seem to discourage us from so hastily drawing a line between technological and wizardly means of life support. However, these people obviously have not considered the method dubbed the "Is This Indistinguishable Magic/Technology Connected to a Power Cord?" test. ↑ It's encasing people in enchanted wax. You twit. ↑ The Tory press is now known to have exaggerated Napoléon's height. The press alleged his height to be 150–155 centimetres; however, his actual height was 123–128 cm.